And this is the second time in four years that has happened. That investigators know of - so far. A campaign of price manipulation accounted for at least half of the increase in the price of Bitcoin and other cryptocurrencies (in 2017). Prices were pushed up by activity at Bitfinex, one of the largest and least regulated exchanges. Patterns suggest the exchange worked to push up prices when they sagged at other exchanges, us(ing) a secondary virtual currency, Tether, created by the owners of Bitfinex. Bitcoin’s big price increase in 2013 was caused by price manipulation at what was then the biggest exchange, Mt. Gox. 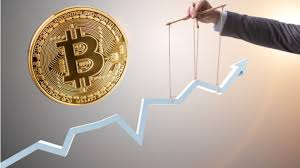 A concentrated campaign of price manipulation may have accounted for at least half of the increase in the price of Bitcoin and other big cryptocurrencies last year, according to a paper released on Wednesday by an academic with a history of spotting fraud in financial markets. The paper by John Griffin, a finance professor at the University of Texas, and Amin Shams, a graduate student, is likely to stoke a debate about how much of Bitcoin’s skyrocketing gain last year was caused by the covert actions of a few big players, rather than real demand from investors. Many industry players expressed concern at the time that the prices were being pushed up at least partly by activity at Bitfinex, one of the largest and least regulated exchanges in the industry. The exchange, which is registered in the Caribbean with offices in Asia, was subpoenaed by American regulators shortly after articles about the concerns appeared in The New York Times and other publications. Mr. Griffin looked at the flow of digital tokens going in and out of Bitfinex and identified several distinct patterns that suggest that someone or some people at the exchange successfully worked to push up prices when they sagged at other exchanges. To do that, the person or people used a secondary virtual currency, known as Tether, which was created and sold by the owners of Bitfinex, to buy up those other cryptocurrencies. “There were obviously tremendous price increases last year, and this paper indicates that manipulation played a large part in those price increases,” Mr. Griffin said. Bitfinex executives have denied in the past that the exchange was involved in any manipulation. The company said on Wednesday that it had never engaged in “any sort” of market or price manipulation. “Tether issuances cannot be used to prop up the price of Bitcoin or any other coin/token on Bitfinex,” Jan Ludovicus van der Velde, Bitfinex’s chief executive, said in a statement. The new paper helped push down the already sinking price of Bitcoin and other cryptocurrencies on Wednesday. The price of Bitcoin fell as much as 5 percent after the report was published, approaching its lowest point of the year. Bitcoin is now down more than 65 percent from the highs it hit late last year. The authors of the new 66-page paper do not have emails or documents that prove that Bitfinex knew about or was responsible for price manipulation. The researchers relied on the millions of transaction records that are captured on the public ledgers of all virtual currency transactions, known as the blockchain, to spot patterns. This method is not conclusive, but it has helped government authorities and academics spot suspicious activity in the past. In particular, Mr. Griffin and Mr. Shams examined the flow of Tether, a token that is supposed to be tied to the value of the dollar and that is issued exclusively by Bitfinex in large batches. They found that half of the increase in Bitcoin’s price in 2017 could be traced to the hours immediately after Tether flowed to a handful of other exchanges, generally when the price was declining. Other large virtual currencies that can be purchased with Tether, such as Ether and Zcash, rose even more quickly than Bitcoin in those periods. The prices rose much more quickly on exchanges that accepted Tether than they did on those that did not, and the pattern ceased when Bitfinex stopped issuing new Tether this year, the authors found. Sarah Meiklejohn, a professor at the University College London who pioneered this sort of pattern spotting, said the analysis in the new paper “seems sound” after reviewing it this week. Philip Gradwell, the chief economist at Chainalysis, a firm that analyses blockchain data, also said the study “seems credible.” He cautioned that a full understanding of the patterns would require more analysis. Mr. Griffin previously wrote research pointing to fraudulent behavior in several other financial markets. He drew attention for a 2016 paper that suggested that a popular financial contract tied to the volatility in financial markets, known as the VIX, was being manipulated. A whistle-blower later came forward to confirm those suspicions, and now several active lawsuits are focused on the allegations. Beyond his work at the University of Texas, Mr. Griffin has a consulting firm that works on financial fraud cases, including some in the virtual currency industry. The new paper is not the first academic work to identify manipulation in the virtual currency markets. A paper published last year by a team of Israeli and American researchers said much of Bitcoin’s big price increase in 2013 was caused by a campaign of price manipulation at what was then the biggest exchange, Mt. Gox.